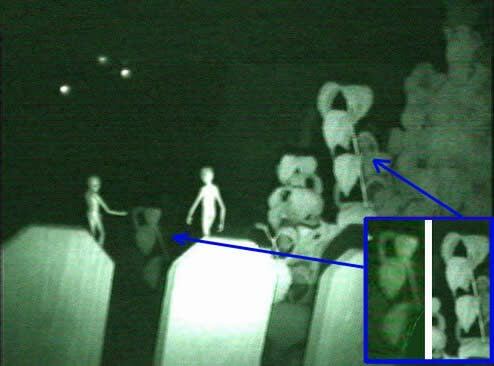 From Italy (www.sentistoria.it) comes some fairly impressive, but nonetheless clearly hoaxed "Greys in the Garden" shots, said to have been shot with an infrared camera/lens. Pic one demonstrates some tom foolery with the branches of the tree in the foreground. Additionally, I thought two of the plants in the third posted Italian photo looked duplicated way too much to be coincidence. I made a comparison in the attached. 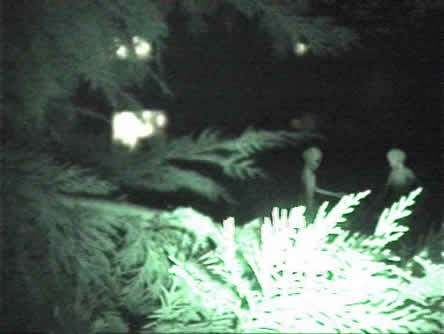 One comment about the "aliens" - "nightshot" makes peoples eyes glow brightly when they are looking towards the camera. 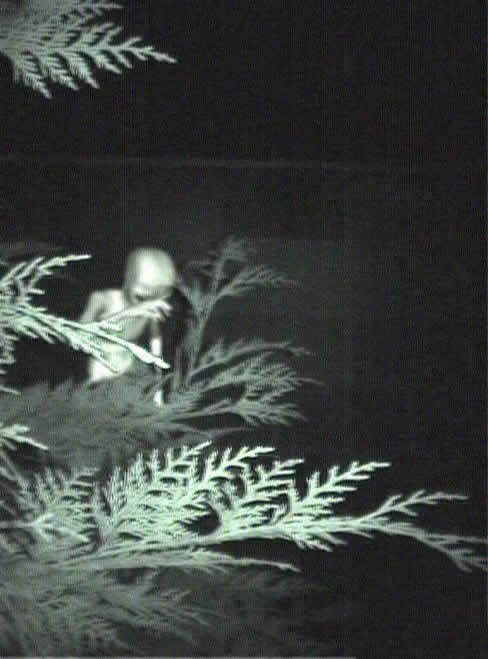 The one "alien" who appears to be looking at the camera does not have this characteristic glow. 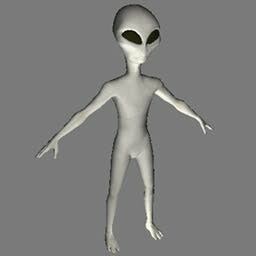 This would suggest a model, but then again, maybe "alien" eyes don't reflect the same way as regular eyes do. They are reporting the images coming from England in late 1999. This site has been up a lot longer than the italian one. The way I look at these things, is sometimes the most incredible, the most bizare, the most outlandish, tends to be closest to the truth. People who investigate these things see fakes all of the time. How often do we actually get the real thing, and how would we honestly know if it was the real thing or not? To be perfectly honest, I don't see all of these 'flaws' you are reporting. Just like I see no big worries regarding chemtrails, or the hoaxed moon landings. It's all a matter of perspective. I still stand by them, because there are certain elements that truly stood out to me. I have a camera just like this, and have recorded people with night vision. No human being would be able to perceive the infrared beam being projected from the camera. Secondly, you can see the beam reflecting on the aliens eyes. That shouldn't happen either. Thirdly, the plant does not look copied and pasted to me at all. It's not the same branch, you can see the top left leaf is turned at a different angle. Fourthly, the one branch that looks superimposed in the foreground, you can see the same distortion that the camera shows for the entire image. I have also noticed such strange images with my own camera. Using night vision distorts any image you pickup, because it is a single beam being projected from the bottom of the camera. The reason it looks fake is because it is catching the IR directly from the beam. It is brightest and focued mostly in this area, essentially lighting it up. Feel free to post these comments, I still stand by the images. Nope it's not a 3D modeling plane - no 3d graphics programs were used. The illumination of the "nightshot" camera does a fair job of giving you the distances involved. The brighter the object, the closer it is to the camera and the center area most illuminated by the infrared LEDs. 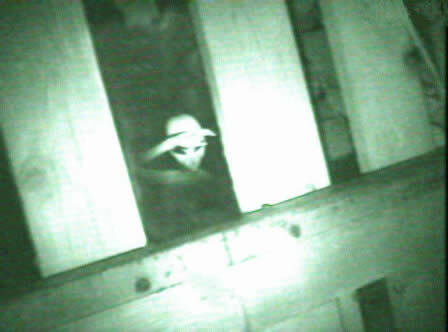 The third picure from the top shows the two alien models attached to the tops of the two fence planks that they are supposed to be standing behind. 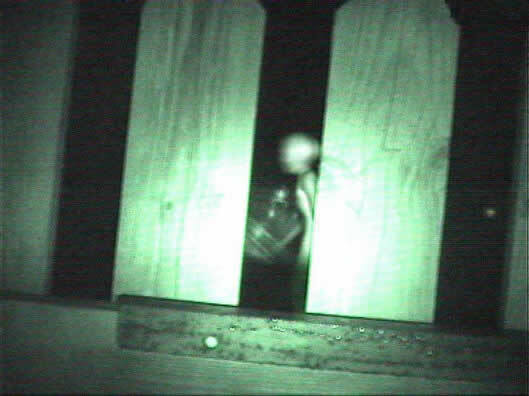 Notice the shadow on the right fence plank (the one without an "alien" attached to it). The infrared LED is mounted below the camera lens. There should be the same type of shadow cast upon the "aliens" but there is none. This means that the "aliens" are the same distance away from the camera as the fence. 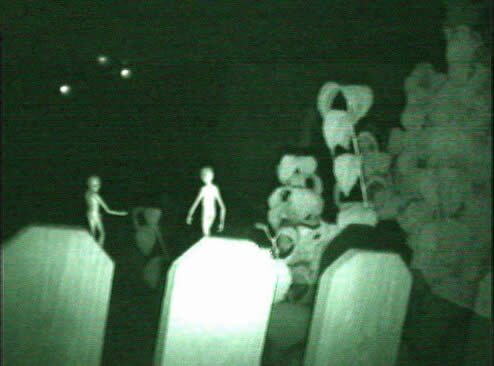 If they were actually standing behind the fence, they would be much darker than the fence and in fact, the plant that is in between them and "behind" them, is considerably darker than, and farther away from the camera than the two "aliens". I guess their height is 3 to 6 inches. I suspect that the other shots use other "alien" dolls of various sizes.